Are you doing everything you could with everything you are given? Have you been looking to take your life to the next level? It’s time to give yourself permission to do extraordinary things in your life…because you deserve to be somebody who makes a difference. An acknowledged transformational leader and a leading expert on success and raising human potential, Chaney Weiner has inspired millions of people around the world, sharing his breakthrough methods for personal and professional success in the seven different areas of life. 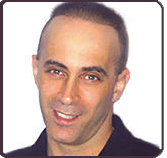 Chaney and his work have been featured on Montel Across America with Montel Williams, Hollywood Confidential with Leeza Gibbons, Hay House Radio, and on hundreds of radio shows throughout the world. Discover your hidden brilliance and uniqueness and expand your human potential to live a magnificent, purposeful, and meaningful life.